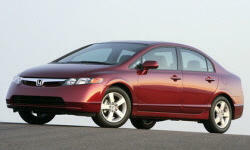 Why the 2007 Honda Civic? For the level of performance the Si offers, the mileage one can acheive is superb. I average a bit under 30mpg, and have seen as high as 36 on slow highway trips. Not as good as a Corolla, but a hell of a lot faster and more fun! Perhaps the second best handling FWD economy car next to the Mazdaspeed 3. Very sharp steering wheel response, only minimal understeer, and it can be pushed through corners at astonishing speed compared to the regular Civic or other similar cars. Honda has built a name for reliability, and the statistics on this site back it up. Personally, with about 40k miles, I have yet to have a non wear-part related issue. Why Not the 2007 Honda Civic? The Si is not quiet. It makes the normal Civic seem quiet in comparison. It makes almost everything quiet in comparison. The exhaust sound is annoying on the highway, and the car makes a lot of noise just keeping up with traffic when accelerating. The Si has the weakest engine of all the performance compacts it competes with. It has little low end torque. Under 5800RPM, it is a slightly faster than average, loud economy car. The Civic is an ugly car, to me. The Si makes it worse, adding an obnoxious and useless spoiler to the rear. At least the wheels look nice!